(CNN) - Republican presidential contender Herman Cain will address the latest sexual harassment allegations against him at a Tuesday afternoon news conference, his campaign announced late Monday. 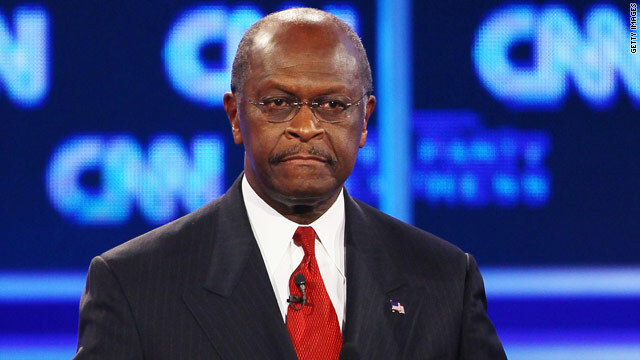 Herman Cain is my candidate. I think he will make a great President. I love Herman Cain. @ NOBAMA – "Isn't it so convenient that a fictitious story is brought out every day and is a little more shocking every day. So how do you know it's the truth? Because it's on the news every day, that makes it the truth? YOU ARE BEING LIED TO"
What say you about the nonsense Faux News spouts every day until you folks believe it as fact?? There are three important lessons to be learned here. make them prove each and every element of whatever they assert in a court of law where they can be held accountable. While it may be less costly to "pay off" or "roll over", than fight, the long term effect of doing so may follow an otherwise innocent person to the grave. Hind sight: Had the first accustaion against Cain been addressed in this manner there might not have been others......probable wouldn't have been. SECOND: Whenever accusors (copycat or otherwise) are aware that their accusations will be scrutinized for truth and honesty in a court of law they will likely not be wiling to bear false witness....particularly if they know that they will be held accountable. And THREE: More frequently than not "culpable" people are "over" accused. E.G. There is a difference between referring to a person as "sweet heart" and some other "slight" that may be imagined. IIf Cain is innocent what can he possibly say to silence his critics? He has already said he is being falsely accused? This is a no win situation for Cain.